In Mirror, the floral motif from a patterned wallpaper is singled out in two white frames. In the first, the cut portion is covered in a mirror and falls forward, reflecting a distorted version of itself. 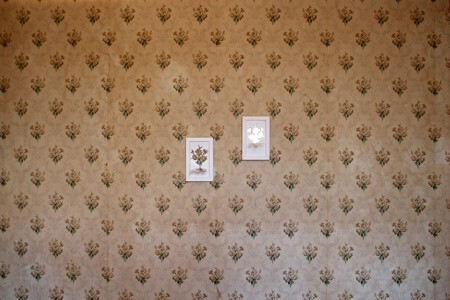 In the second, the outline of the floral motif is cut out and backed by a mirror, becoming a portal through which the viewer can see themselves within the repeated pattern of the room around them. Like bookends, these discrete objects are the inverse of one another, simultaneously concealing and revealing aspects of the room around them to open up new layers of meaning. This work was created during an artist residency at DRAWinternational in Caylus, France.